Cocktails for the 75th anniversary of Prohibition's repeal. Pop quiz: The 18th Amendment to the United States Constitution—what was its purpose? Shame on you (and your high school history teacher) if your answer has anything to do with guns, civil rights or suffrage. In 1920, the 18th amendment made the sale, transportation and manufacture of alcoholic beverages illegal. The Constitution’s 21st Amendment, which FDR signed into law on December 5, 1933, repealed the 18th Amendment and made it legal again for Americans to imbibe with abandon. And if that isn’t cause for celebration, reasons the management of a restaurant/bar in Boston’s Kenmore Square, what is? Eastern Standard Kitchen & Drinks has been quietly celebrating the anniversary of the repeal all year by resurrecting a dozen Prohibition Era cocktails, many of which are all but extinct in today’s bars, and introducing them to a new generation of cocktail drinkers. These classics include the Income Tax Cocktail, the Charles Lindburgh, the Scofflaw Cocktail, and the Monkey Gland (named for a quack medical procedure of the time). Each cocktail costs just $10; a flight of 2-ounce samples of all 12 concoctions is $75. Eastern Standard’s Prohibition festivities will culminate on December 5—the day that the 26th Amendment went into effect—with an all-night Roaring Twenties party. Jackson Cannon—mixologist, cocktail purist and Eastern Standard’s bar manager—takes his drinks very seriously: He makes many of his cocktails’ ingredients (including his own grenadine) in house, and travels widely so that he can study liquors and their storied pasts. In the last few weeks before the repeal’s anniversary, Cannon offered seminars on the Golden Age of the American cocktail; tiki and exotica; and the role of bitters in cocktails. A tribute to the Constitution’s 16th Amendment from Harry Craddock, this cocktail should make whatever you owe the taxman a little easier to bear. Shake all ingredients in a cocktail shaker filled with ice. Strain into a chilled lowball glass and garnish with an orange wedge. Not a law-abiding citizen? This one’s for you. This version of the Scofflaw is the classic, from Harry’s New York Bar of Paris. Shake all ingredients in a cocktail shaker filled with ice. Strain into a chilled lowball glass. Using a vegetable peeler or channel knife, peel some lemon zest over the glass (but do not use the zest as a garnish). Lindburgh’s trip on the Spirit of St. Louis was the first nonstop flight to Europe over the Atlantic Ocean. He landed in France after 33 hours and 30 minutes, at which point ,we can only surmise, he really could have used one of these cocktails. Rinse a chilled martini glass with a touch of apricot brandy. Stir gin, Lillet and bitters with ice; strain into the martini glass. Does this cocktail sound vaguely familiar? Think back to high school English: Jack Barnes, narrator of Hemingway’s The Sun Also Rises, drinks a Jack Rose at a bar in Paris while he awaits Lady Bret Ashley. Shake all ingredients over ice and strain into a chilled martini glass. Bring mixture to a boil; reduce to a simmer and allow mixture to thicken slightly. Finish grenadine with a small amount of orange blossom water. Let cool, and keep refrigerated. 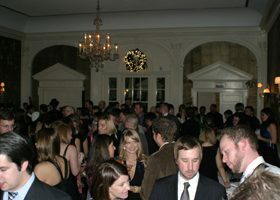 For a listing of Prohibition-era speakeasies in your city and for tips on how to host your own Repeal Day party, visit http://www.prohibitionrepeal.com/contact/visit.asp.